With just a month and a half left until Saw 8, which is also being called Jigsaw, Lionsgate has released a new series of posters revealing some of the members of Jigsaw's army. For fans on social media, you can now tweet with the hashtag #JigsawSavedMe to unlock a new Jigsaw mask emoji on Twitter. While it remains to be seen if any more footage will be released between now and Halloween, this is certainly shaping up to be one of this fall's most anticipated horror movies. The posters feature a number of unidentified characters, both male and female, who seemingly swear their allegiance to the iconic Jigsaw. 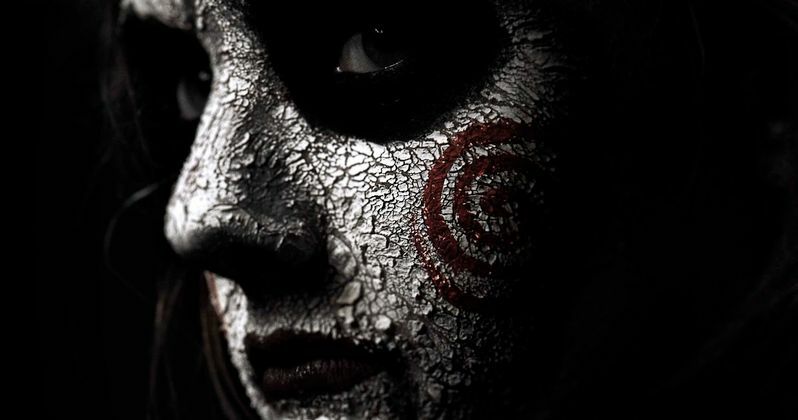 Each character has their face painted as the now-iconic Jigsaw doll Billy, with the posters featuring brief taglines such as, "He Is Everything, "He Is Everyone" and "He Is Everywhere," alluding to the legacy that the late John Kramer (Tobin Bell) left behind, after passing away at the end of Saw III. Lionsgate has also launched the website JigsawSaves.com, which has a unique mission statement for Jigsaw's followers that you can read below. "Much has been said about John Kramer. The flesh is finite. His work, his legacy, is the gospel that wakes us from our stupor and gives our lives purpose as the clock continues to count down. I have followed his teachings and learned from his philosophy, and I have dedicated my life to dissecting, testing, and understanding that 'vital piece.' Jigsaw becomes legion: a horde of disciples who understand a life is measured not in increments but by a single defining moment. How many of us truly know what we are capable of until we are given the ultimate choice: Live or Die? How many of us crave the clarity only the games can provide? How much of your own blood are you willing to spill, how many pounds of flesh are you willing to shed, to be free? This world is suffering. You are suffering. But you are not alone. Not anymore. Let the games begin." The site even allows fans to become a disciple of Jigsaw, which you can accomplish by either submitting a photo or writing a confession that proves you're worthy of following the legacy of Jigsaw. The site features a number of photos and messages submitted from fans, one of which features one fan's massive tattoo of the Jigsaw puppet riding its tricycle. With just over a month left until Jigsaw hits theaters, it remains to be seen how many "disciples" Jigsaw will attain, and if they might have something special planned before the movie hits theaters. Back in July, a photo revealed one of the new Jigsaw traps that fans will get to see in theaters. The trap featured Laura Vandervoort's character Anna sinking in quicksand, although there is surely much more to this trap, but we'll have to wait and see. Directors Peter and Michael Spierig (Daybreakers, Predestination) would not confirm whether or not Tobin Bell will re-surface in any way shape or form as Jigsaw, but we'll find out for sure on October 27. The eighth installment of the Saw franchise will be going up against Paramount's Suburbicon, Universal's Thank You For Your Service and Open Road Films' All I See Is You. Take a look at these new posters from Jigsaw below.